West Windsor, NJ – Junior rowers from 12 local high schools will be representing Mercer Rowing as they compete for the title of the top Junior crew in the country at USRowing’s Youth National Rowing Championship this weekend in Sarasota, Florida. The Youth National Championship brings in the top crews from throughout the United States to vie for titles in 18 different events. 163 teams earned the right to enter boats in the National Championship through their performance at regional championships. Racing starts with the first round of competition on Friday, June 12 with the finals concluding on Sunday, June 14. The Mercer Rowing Program will be competing in the Men’s 8 with coxswain, Men’s Lightweight 4 with coxswain, Women’s 8 with Coxswain, Women’s Lightweight 8 with coxswain and Women’s 4 with coxswain. The Lawrenceville School is sending a Women’s Lightweight 4 with coxswain and Peddie will be competing in the Women’s 4 with coxswain. All of these crews earned the right to complete at the Mid-Atlantic Junior Regional Championships held on Mercer Lake, May 9-10, 2015. In 2016, Princeton National Rowing Association and its Mercer Rowing Program will host the USRowing Youth National Championships at Mercer Lake in Mercer County Park, West Windsor, NJ. 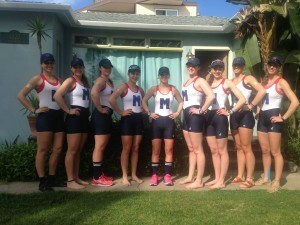 The Princeton National Rowing Association, a 501(c)3 organization, operates the Finn M.W. Caspersen Rowing Center located on the shores of Mercer Lake, Mercer County Park in West Windsor, New Jersey. The Princeton National Rowing Association is dedicated to operating a world-class training site for our nation’s elite athletes, providing opportunities for area youth to excel in the sport of rowing and to expand rowing in the area through community-based programs. PNRA runs the Mercer Junior Rowing Program which provides rowing opportunities for youth from over 30 area schools and the Mercer Masters Rowing Program which provides rowing opportunities for adults. The center is a home to the USRowing National and Olympic Teams, as well as rowing clubs and schools. PNRA received generous support from University Orthopaedic Associates, Harry’s Army Navy, JL Racing, Resolute Racing Shells, Wells Fargo Advisors-Gould Group, Red Roof Inn, Hampton Inn and Residence Inn by Marriott.